FAQs - Team Mini-Max, The World's Best Ultralight and Light Plane Kits and Plans. Q: What defines an ultralight aircraft in the USA? A: An ultralight must be single-seat, weigh less than 254 lbs. empty (but with some allowances for floats and parachutes), have a 5 gallon maximum fuel capacity, a 55 knot maximum speed and a power-off stall speed of 24 knots or less. Ultralights do not need to be registered with the FAA. Reference the FAR Part 103 regulations for full details. Q: Do I need a license to fly Ultralight aircraft in the USA? A: No, the FAA does not require a license to fly an ultralight, but it would be foolish to fly any aircraft without proper training. Q. What if I build an aircraft that exceeds the specs for an ultralight? A. Then it must be registered as an Experimental Amateur Built (EXP-A/B). 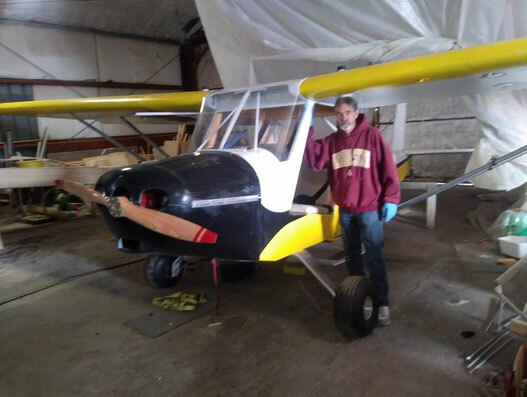 Our Sport aircraft, V-Max, Eros, Hi-Max and AeroMax fall into this category.The FAA defines Amateur Built as "...the major portion has been fabricated and assembled by persons for their own recreation or education." Q: What type of license do I need to fly an EXP-A/B aircraft in the USA? A: That depends on it's specifications. All of our EXP-A/B aircraft fall within the Light Sport Aircraft specs, so you can fly them using a Sport Pilot's License. This is much easier to obtain than a Private Pilot's License and doesn't require a medical certificate. Q: Should I build an Ultralight or EXP-A/B? A: Good question! Team Mini-Max has excellent choices in both categories. Our ultralights are a little more economical and offer freedom from government regulation, but they have some airspace restrictions. Our EXP-A/Bs are a little sturdier and more powerful (important if you're somewhat on the heavy side) and offer more engine choices. Please call or email us if you have any questions. Q: I see a lot of Ultralight and Light Sport aircraft on the market. Why should I buy a Team Mini-Max kit? A: They're fun to build, fun to fly, economical and have a 28 year reputation as being the finest small aircraft on the market. In other words, for a Minimum investment you'll get the Maximum fun! Q: Why are you giving away the plans? A: We want to get as many people as possible building and flying our great lineup of aircraft. And we hope you'll come to us when you need to buy kits, parts and raw materials. Q: Why don't you have plans for the AeroMax? A: The AeroMax is our newest aircraft and most advanced kit. It was designed from the ground up for CNC laser-cut fabrication. The complex part shapes would be tedious to layout and cut by hand. But because of the ingenious way they fit together and laser marked notes right on the parts, the assembly time is much quicker than traditional wood construction. No plans are required; just a builder's manual. Q: Why are all your designs wood? Why not steel tube, aluminum, composites, etc.? A: Wood is natural, warm and easy to work with. You don't need a lot of expensive specialized tools. Pound for pound aircraft-grade wood is stronger than steel. If you look at the cellular structure of wood you'll see why it's sometimes called “nature's composite”. A wood structure absorbs sudden loads in turbulent air and landings. It is forgiving in a crash. We have seen some serious crashes where the aircraft is heavily damaged but the pilot walked away with little injury (except perhaps to his pride). For more information on wood structures please read our More Info - Design Philosophy page. Q: There are many different types of wood glue. Why do you use T-88 epoxy? A. Because it's extremely strong. A T-88 joint is stronger than the wood itself. Unlike other types of adhesives, T-88 epoxy can be used in cool, hot or humid conditions. If your shop is cool it'll take a little longer to cure, and if it's hot, it will cure quicker. In either case, the joint will be just as strong. Q. To make construction simpler why not just laser cut one-piece wing ribs from a sheet of plywood? A. Like all parts of the Mini-Max, the ribs are designed to provide maximum strength with the minimum weight. The truss design allows us to orient the wood grain of each part to take the highest load. The result is an extremely strong wing rib that weighs less than 150 grams (5 ounces). Q: What are the advantages of the Mini-Max fleet over aluminum tube & sailcloth ultralights? A: Bolt-together tube & sailcloth ultralights can be built quickly and at a reasonable price. However the Mini-Max airfoil and covering system is much more efficient, and with it's UV protection, the covering lasts much longer. Mini-Max aircraft are costructed from aircraft grade wood - the best building material available. Our aircraft look and fly like a “real” airplanes. Q. How long will a wood structured aircraft last? A: Over 50 years, if it's built and cared for properly. All wood surfaces should be coated with varnish before covering. As an example, one of our Team members, Lowell Farrand helped restore an 80 year old wood & fabric Travelaire. When they removed the fabric they found the wood structure was good as new. Q: I've never built an aircraft before. How do I know I'm capable? A: Most of the Mini-Maxs flying today were constructed by first-time builders. There are no extremely difficult challenges in the building process; just a lot of relatively simple tasks. Our quickest building kit is the Aeromax. It's CNC laser-cut parts fit together very precisely and save a lot of time in the build process. If you're still not sure, why not buy our empennage “Starter Kit”? For a minimal investment in time and money you'll learn all the basics of wood aircraft construction. It'll give you the confidence to keep building and you'll have a neat conversation piece to show friends and relatives! Q: How much room do I need to build a Team Mini-Max aircraft? A: You can start building ribs on any flat table 5' long. To construct the entire aircraft it would be great to have a hangar or 2-car garage, but many of our planes have been built in a 1-car garage. One woman built a Mini-Max in an upstairs apartment! At the minimum you need room for a 3' x 14' workbench. All the major components (fuselage, wings, empennage) will fit through a standard doorway. Q: How much time does it take to build a Team Mini-Max aircraft? A: That depends on the builder's skill level and the type of aircraft kit. Our basic kits can be built in about 400 hours but the new laser-cut quick build kits only require about 250 hours or less. The most important thing is to keep at it. Taking a few days or weeks off can result in a lot of “head scratching” trying to get back up to speed and remember where you left off. Q: What tools will I need? A: All you really need are a few common hand tools, including a small saw and mitre box. A small belt sander, drill press and band saw will help you work more accurately and save time, but are not required. For details, read the More Info - Building a Mini-Max web page. Q: Why should I build a kit? Why not just buy a used Mini-Max? A: Although you can find well-built used Mini-Maxs for sale, some might not be built to the proper specs or craftsmanship. If you build it yourself you'll know it's done right, and you'll have a great sense of accomplishment. Many of our customers enjoy the building process almost as much as flying. Q: I like your designs, but I'd like to make a few changes. Is that okay? A: PLEASE get approval from Team Mini-Max for any design changes! These designs are the result of years of experience and careful calculations. Changes typically add weight and can compromise the strength or flying characteristics. Be very wary of advice from “armchair experts”. Q. Why do you use that truss landing gear design? A. Most of the negative comments we get about our landing gear design are by people who've never flown a Mini-Max. The landing gear is strong and extremely lightweight. In a crash it's designed to break away, reducing damage to the aircraft and making it less likely to flip over. Because the aircraft has a very light wing loading and we run the tire pressure at only 7-11 psi landing forces are easily absorbed by the tires. Q: Why don't you offer a folding wing option? A: A folding wing mechanism would add weight, complexity and considerable cost. You can easily remove our wings by unfastening a few bolts per side. Q: Do you recommend 2-Cycle or 4-Cycle engines? A: They both have advantages and disadvantages. 2-cycle engines are very light and powerful. They're reliable if you carefully follow the manufacturer's maintenance and operation requirements. 4-cycle engines are a little heavier but burn less fuel. Some think they're more reliable than 2-cycle engines. Many pilots like the sound of a 4-cycle engine. Q: Do you recommend a high-wing or mid-wing aircraft? A: This choice is entirely up to the builder. A high wing offers sun protection on a hot day. You can look directly below while flying and they're a little more stable. On the other hand, some pilots think our mid-wing aircraft look sportier. With the pilot at the exact CG (Center of Gravity), they're a little more maneuverable, but can't be flown hands-off. Both types share the same wing, empennage and engine options. A couple of our customers have built 2 fuselages (high and mid-wing) so they can fly either type after a relatively quick change. Q: Where are the kit parts manufactured? A: For kits sold in the USA the stock wood and metal parts come from Niles, Michigan, and the laser-cut and custom fabricated metal parts are produced in Mishawaka, Indiana. We also have production facilities in Australia and China to help supply customers in those parts of the world. Q: Where can I go for support during the build process? A: Although we have tried to make the plans, construction manual and videos as clear as possible, we realize you still might have questions throughout the construction process. Feel free to call us (1-855 Team-Max) or email (support@team-mini-max) at any time. Q: Is the Lonesome Buzzards forum a good source for help? A: Well, yes and no. It's a great worldwide community of people who support each other in their shared passion – building and flying Mini-Max aircraft. The forum can be a good source of motivation and knowledge, but anyone can post an opinion, whether they're qualified or not. Does the poster have an engineering degree? How many aircraft has he built and flown? Be very careful about taking advice from any online forum, especially if it contradicts information from the factory. Contact us if you have any questions. Q: Why don't you offer a two-seat aircraft? 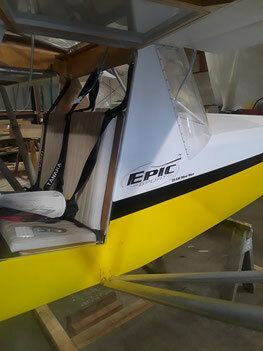 A: Increasing demand for a two-seat Light Sport aircraft which has the advantages of the higher useful load percentage as compared to gross weight offered by wood and epoxy construction has led us to develop an upcoming high wing aircraft called the "Epic Sport", which should be available soon. See the page on the "Epic Sport" on this site. Q: Will I be able to buy insurance for my aircraft? A: You should be able to obtain affordable liability and aircraft hull coverage through the EAA (http://www.eaa.org/insurance). Many of our customers are “self-insured”. The planes are so well designed and the landing speeds are so slow that most mishaps are repairable at relatively little cost. Q: If I'm building a 1-seat aircraft how can I get flight instruction in it? A: We recommend dual instruction in an “ultralight type” 2-seater because the high drag and very light wing loading will approximate the flying characteristics of a Mini-Max. If the trainer is a tri-gear, you should also get time in a tail-dragger, like a Cub or Champ. Q: I live at 6500 feet, and regularly fly into 9000+ foot airports? A:The service ceiling is really "how high can you stay warm!" The pilot runs out of air at 10,000 ft. A 2 cycle engine can go to 17-18,000 ft. Although the airplane starts loosing performance above 5,000ft. So, a Mini-Max at Denver will need a good 447 or 503 or above to have good performance. Q: Can I put a Full VW engine On 1030, 1600 or 1700? A: Yes, you will need to follow the plans for the 1550 V-Max for the Wings, Struts, Firewall forward plans. If you still have questions please email or call us.